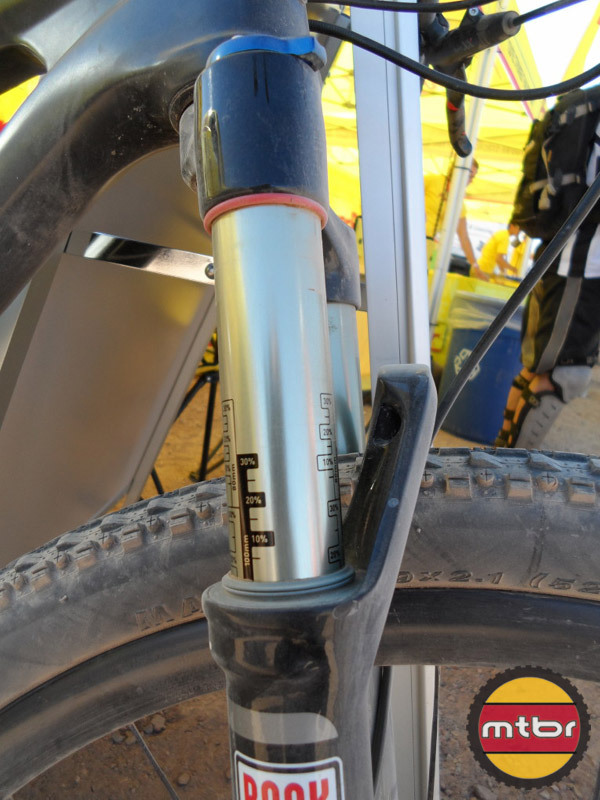 This is part 2 of Krob’s bike tests from Interbike’s Outdoor Demo. 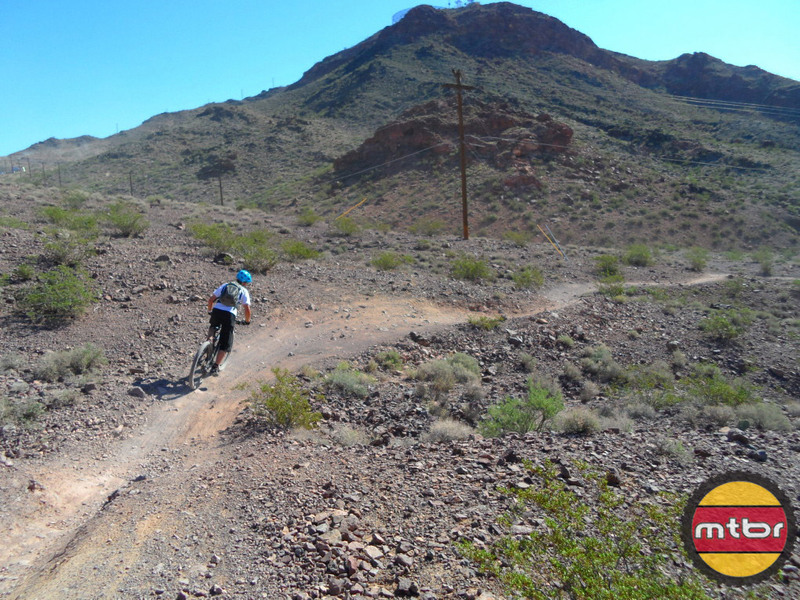 Be sure to read Krob’s All Mountain Bike Tests at Interbike (part 1). My normal riding buddy Craig (“Craigstr” in the Mtbr forums) was busy working a booth today so I was on my own for my bike testing on day two this year. I had two or three bikes that I HAD to get to so went to the booth where I thought it would be hardest to get bikes later in the day first thing. 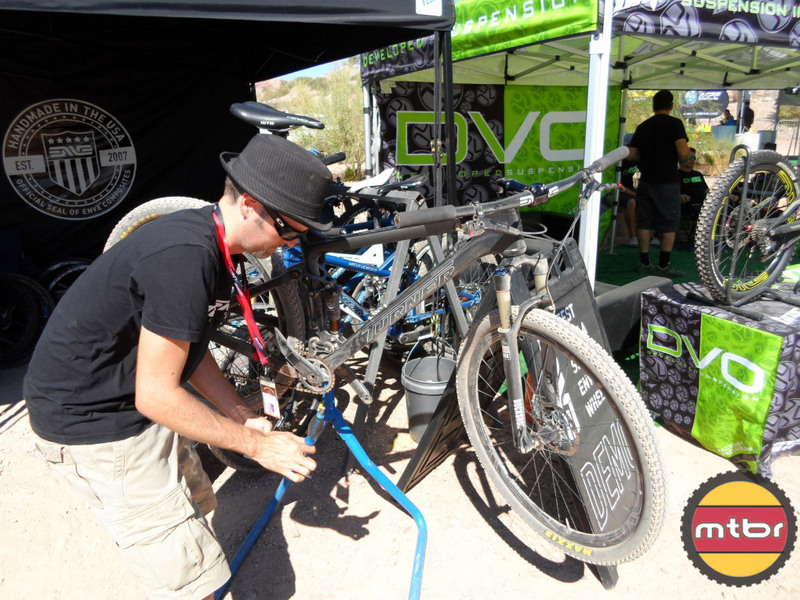 Turner had partnered up with Enve Composites in order to demo their bikes this year and showcase Enve wheels. Thanks to someone for tipping me off or I never would have found them. I arrived at 8:45 am and Jarrett from Turner wasn’t there yet so I chatted with the guys from a Enve for a few minutes until he showed up. They have some cool high zoot stuff. I was able to check out this beautiful black Czar in a size large that was spec’ed out very nicely with Enve composite wheels and bar and a SRAM XX1 groupo. Weight must’ve been in the low twenties. I love the traditional, yet elegant lines and proportions of this carbon beauty– A very, very nice looking frame. Dave was able to stay with his simple, mostly straight tube industrial look but still update it. 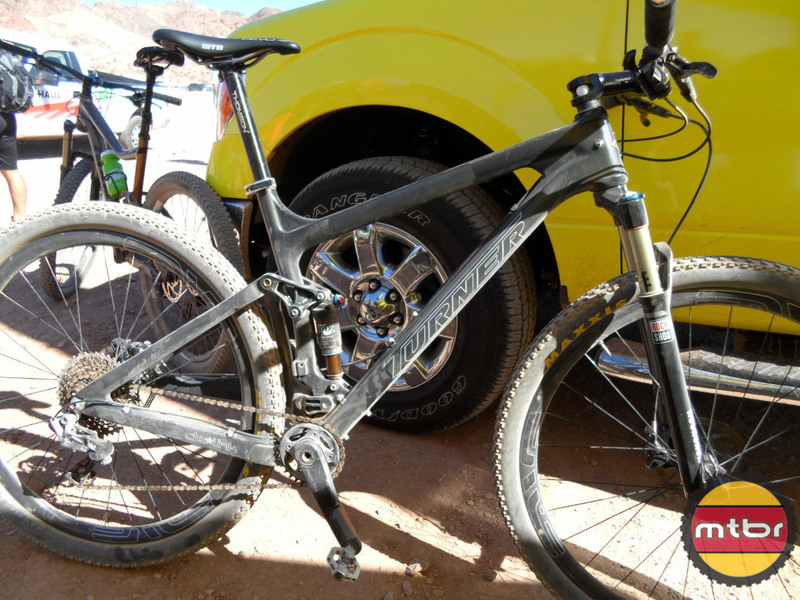 I suspect (hope) Dave is working on a similar looking carbon design for a 140-150mm 27.5”frame for next year. Nice wide Enve composite bars and comfy ESI foam grips. Jarrett got my pedals on, adjusted the sag, tightened a squeaky headset, and sent me on my way. Every time I pulled out of the paddock area with one of these stunningly expensive carbon bikes I just had to shake my head and smile at how cool this all is. The other thing that always stunned me was how these lightweight, efficient pedaling bikes practically ride themselves up hills. I saw a few guys on electric assist bikes heading up the road rapidly and with almost zero effort. The Czar felt a lot like that. Sizing was perfect and I really appreciated Turner outfitting this bike with some decently wide bars and shortish (for XC) stem. It really does add to the bike’s capability and confidence level when attacking the trail. The climb up was very impressive. It seemed like so little effort was required to keep the Czar rolling forward and upward. It handled the occasional rocky outcropping and step up with ease and I had to keep reminding myself that this was a 100mm XC race bike. For the amount of travel (or lack thereof) I was surprised at how well it smoothed out the bumps in a controlled and efficient manner. I didn’t notice the bigger wheels really when maneuvering through a few tight spots but I’m sure they were at least partially responsible for getting me through some gaps in the trail surface without dropping down into holes and slowing forward progress. Once at the top of this trail I peeled off and climbed up the loose, steep, techy entrance to Caldera. This is my favorite test of a bike’s tech climbing chops. I was only able to clean the whole thing on a couple bikes and the Czar was one of them: Very impressive climber. Pointing it back downhill displayed another Czar strength which I’d read about but about which I was somewhat skeptical. Well, call my skepticism erased. Tech chutes were handled with authority (once I got my multi-tool out and lowered the non-QR, non-dropper seat post. Points deducted! ), and the flowy, bermy lower sections were just plain erased. I’m sure the ultra-stiff Enve carbon wheels add to this feeling of confidence both climbing and descending. No wobble or vagueness felt here at all. Good stuff. Following this descent I took it out on the more XC Lakes Loops which are spiced up with a few Bootleg-esque features like booters, deep g-outs and the occasional rock garden. Wow. The Czar ruled on this stuff. My only gripe here was a very annoying crack/creak that originated from somewhere down near the bottom bracket area at the bottom of each G-out, landing hard off booters, and while cranking hard while pulling up steep standing sprints. I even stopped to check to make sure the rear triangle or lower mini-link wasn’t broken or something. 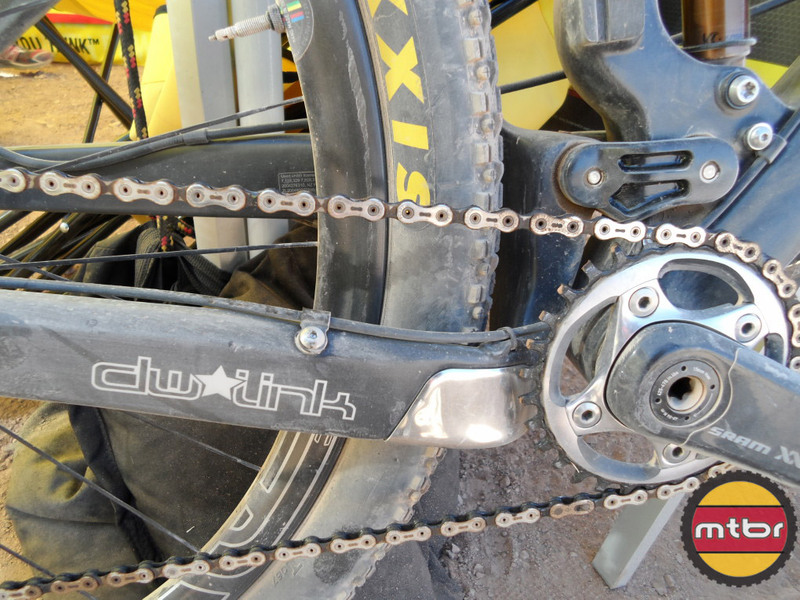 When I got back to the tent, we were able to trace it to the SRAM clutch derailleur. After we figured that out I remembered a couple people mentioning this on earlier reports and I believe LeeL actually posted up a remedy for it. 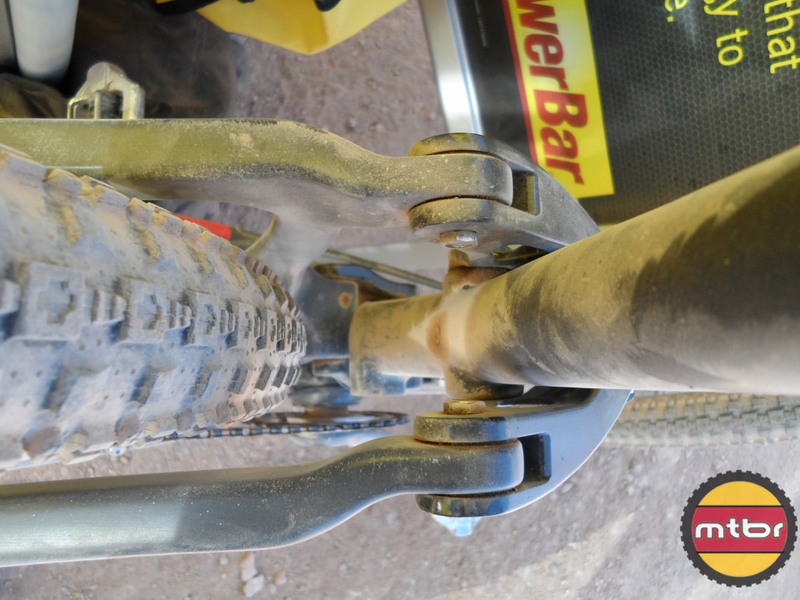 I bottomed the front and rear suspension often and not delicately as I pushed the Czar hard through some tougher terrain but it didn’t falter. I would probably opt for a 120 fork and slightly stiffer setting or more bottom out ramp up on the shock if this were my bike, but overall I was very impressed with the Czar. Yeah I used all 100mm no problem. This SID fork was surprisingly supple and not as flexy as I would’ve guessed. Yep, smashed this O-ring clear to the stops several times as well. The compact, clean look of these dw-links is a testament to good design and clean aesthetics. No front derailleur FTW! Very nice. These Crossmark tires had decent grip and rolled fast, but I did find their limit once in a bermy S-turn. I was able to get a foot down and push it into the berm more to save face but it was a close call. I was a little more respectful after that. This metal plate on the chainstay near the yoke is a nice touch. Thanks for the write up, it is very informative. I am also 52, ride too much and am in the market for a new bike. I ride rocky dry trails in the Blue Mountains (Aust) but also go away on big mountain MTB trips. By and lkarge I earn my turns. The pivot is high on the list, and I am sure will bomb descents, but I have a concern that it might be “too much bike” for everyday “trail” riding. Does to front end wander on tight switchbacks, and is it a slow climber? Well, compared to my 34 lb Chilcotin it was certainly not too much bike for climbing and tight switch backs. I thought it could bomb the rougher stuff nearly as well as the Chili as well….. to a point. I would just need to ride it more to find its limits are. I think with a 160 fork with 35-36mm stanchions it would come very close. Built like it was it was still very capable on the descents, but was super light and super easy to climb on. I wouldn’t worry about its climbing ability unless you’re comparing it to a 22lb hardtail….. and even then it’d beat it on more techy, steppy climbs. Hey Krob … Mega thank you for your outstanding Interbike test ride stories 1 & 2. Very helpful, overflowing with insight not just on the bikes themselves but also components … great reading and much appreciated! Great article! But I have to ask, if this was supposed to be an all mountain bike test why did you ride the Turner Czar and not the Burner or 5.Spot? The Czar is more of a xc bike, while the Burner and 5.Spot are meant for the type of riding you claim to be testing. I just don’t think you gave Turner a fair shot, but that just my thoughts on it. Anyways, thanks for the article. I’m jealous you got to ride so many mouth watering bikes. Talk to Francis. Not sure why they titled it AM bike tests. Probably because most years that’s what I ride at I-bike, but this year I did mostly xc/trail bikes with a few stretching into the AM realm like the Mach 6, Bronson, and Enduro 29. I own a Burner and have ridden the 5 Spot extensively. I also now have ridden the Pivot Mach 6 many times. I think KRob is spot-on with the Mach 6. Super fun descender (mind blowing even), pedals incredibly well up hill (may not be the best, but its up there), is very light for its travel (heck, its even light for a bike with less travel). People talk about its $3k price tag, and I feel thats a bit of a bummer too, but there is more value in their complete build prices. I do wish Pivot would drop the frame-only price a bit. But, its carbon competitors are barely off that price for frameset as well. The only gripe I have of my Burner is its weight. At 30.5lbs with XTR and King wheels its at least 3lbs heavier than the Mach 6. The Burner can climb. The Burner is a great descender. Ive taken my Burner to Moab twice and I couldnt have gone faster bombing down Porcupine if I tried harder. It was incredible. If Dave would build a carbon Burner weighing a bit less he’d have a best of category contender. Thanks for the added perspective Bill. Yes, very light and very capable. Wow. I have ridden the Burner a couple times and owned a 5 Spot so am pretty familiar with those. I would agree with Bill’s assessment. The Burner is very good and would be a close competitor with the Mach 6 and Bronson even as it is…. probably would rate it even better with a 5.5lb carbon frame. I’m hoping that’s what Dave is working on for next year. 150mm travel Carbon Burner FTW! I would say small based on how well the medium fit me at 5′ 11.5″ but you might be able to stretch onto a medium with a shorter stem. Get a ride on both if you can. That’s a very expensive frame to make a mistake on sizing. Strange setup… Long XC stem, tons of spacers under it, and saddle all the way to the front. The Mach 6 looks great but did it really ride like a $3000 frame? For that price, it should be lighter or at least the same as the Bronson’s 5.5ish (Med size) weight. It would be great to see the frame on a scale. Are they that much? Wow, that’ a bunch. I’m quickly becoming a carbon snob after riding mostly carbon bikes this I-bike so would probably opt for the carbon despite the cost. It felt plenty light to me. YMMV. First, thank you for your awesome article. I am very excited about the Pivot Mach 6 and am planning on making a purchase this week. Like you, I am 5’11” (okay you got me by .5″) and ride a large on most bikes (including 19.5″ Remedy and the large Bronson that I demo fit me like a glove). I am heeding your advice about this bike being very expensive to get the size wrong (referring to your response to Eamonn on Sept. 30th). My question is, based on the fact that you could have fit a L or M and after riding the medium Mach 6, if you could do it again, would you have chosen the medium still or would you have switch to a Large? Unfortunately there are no dealers in my area that has any Mach 6 in the show room for me to demo or test so I am hoping you can steer me in the right direction. Thank you! I also ride a large on most frames. My last three bikes have all been large and all the bikes I rode at Interbike except the Mach 6 were large as well. Tough call. If I were purchasing a Mach 6 I would have to ride the large before deciding but every Pivot I have ridden in the past felt (or would’ve felt) better in the medium for me. 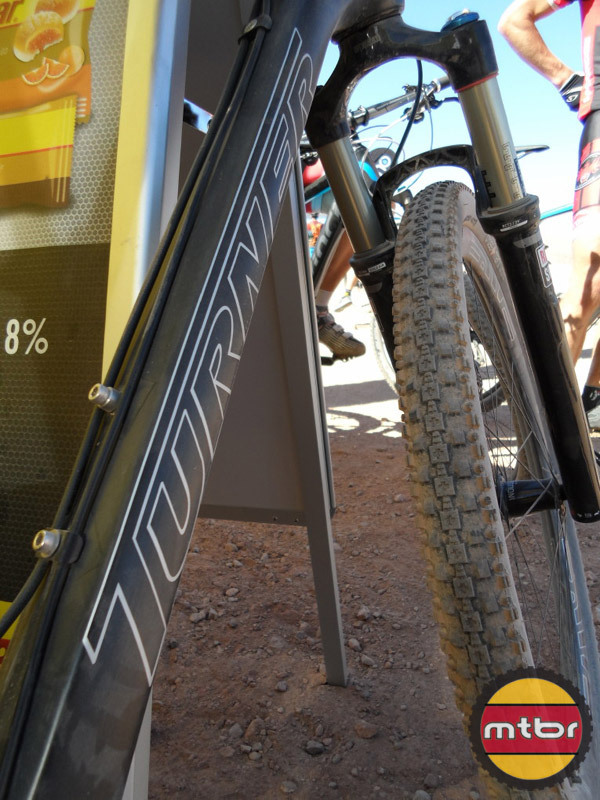 I am not sure if you check these comments, but have you had the chance to ride the 26er Enduro? I am curious how it compares to the 29er. My local bike shop is only carrying the 29er with no plans to carry any 26ers. I currently ride a 2002 Enduro that I purchased brand new, so you could say I have gotton my monies worth out of that bike. I recently picked up a Specialized Big Hit for when I take it to the Mountain and ride the chair up. I want my new bike for both trail climbing and descending. Good pedaling, but it does not have the be the best, I don’t mind if I am slow on the climb. 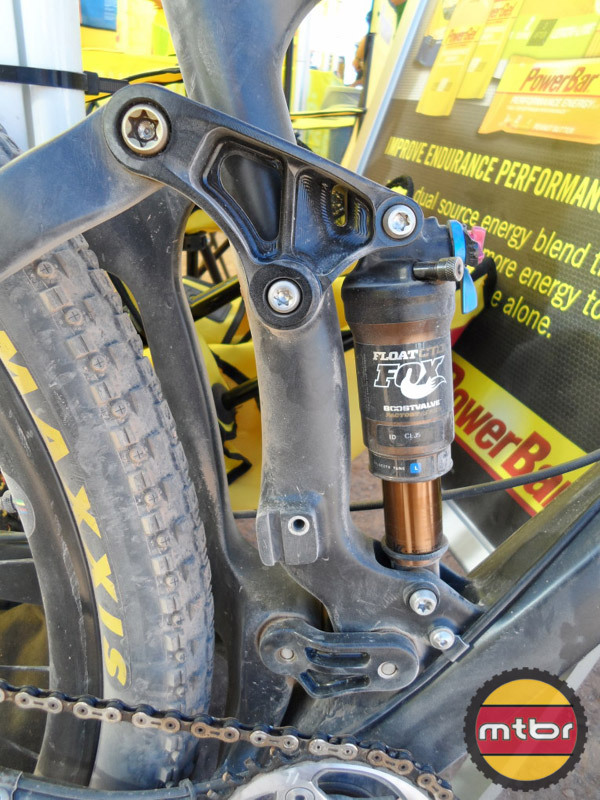 I replaced my Pyslo Forks with Revelations, so the 140mm’s up front helped slack the head angle a bit on my current Enduro, and I like the way it feels. Go with the Pivot MACH 6 for sure!